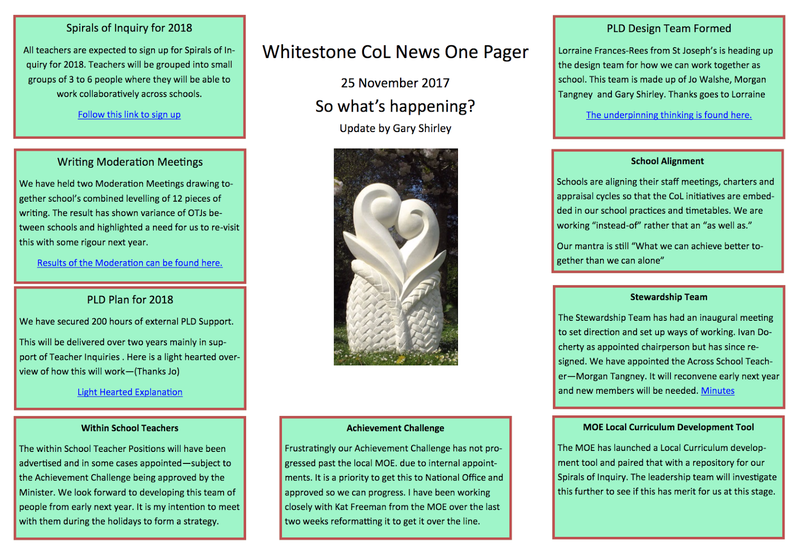 On Tuesday 5th September I attended the first meeting of the Whitestone Community of Learning (CoL) Stewardship Group. Introductions were made and we all explained what our roles are. We had three principals and four board members in attendance from the various schools. Unfortunately the Oamaru Kindergarten Association was not represented at this meeting. Gary explained what the purpose of the Stewardship Group is. This is to provide a feedback loop, to receive reports on projects, discuss and make recommendations back to the providers of the reports. Governance – The Stewardship Group is about governance not management and this will need to be made explicit in the CoL charter. A Collective Voice – To communicate to BoT’s and the wider community. Fostering wider Engagement – Informing people of what it is we are trying to achieve and fostering engagement. Strategy and Planning - this should mimic the processes of but not usurp the roles of the Boards of Trustees. We need to be about the big picture. Policies and Procedures – Paul Olsen (principal of St Kevin’s) suggested that the Stewardship Group be delegated as a sub-committee of each school Board of Trustee. This would mean that Board of Trustees code of conduct would apply, including those for privacy and conflict of interest. This will need to be discussed and agreed to by our board at our next meeting. Accountability – As with our own Board, accountability questions need to be answered, this will make sure we are conscious of what we are trying to achieve and to keep us on task.